Irit is here today with my new post for our WOW! Embossing powders Metal monthly challenge and this time I want to show you a few easy and fast techniques with embossing powders over METAL. This is my Art Deco art piece made with a lot of embossing and a lot of techniques. And the first technique used here is a Crackled Glass technique. Cover your cut out image(I used PWP clip art sheet) with a think layer of Versamark Clear embossing ink and add Ultra High Clear Gloss embossing powder over it. Heat emboss it and let it cool. Add another layer of clear embossing ink and another layer of clear embossing powder. Third time is even better, so make it once more. Now put this glass look piece into your deep freeze section and wait for like 15 minutes. Take it off and break the " glass" with your fingers. Add some brown ink over it. You central piece is all done. 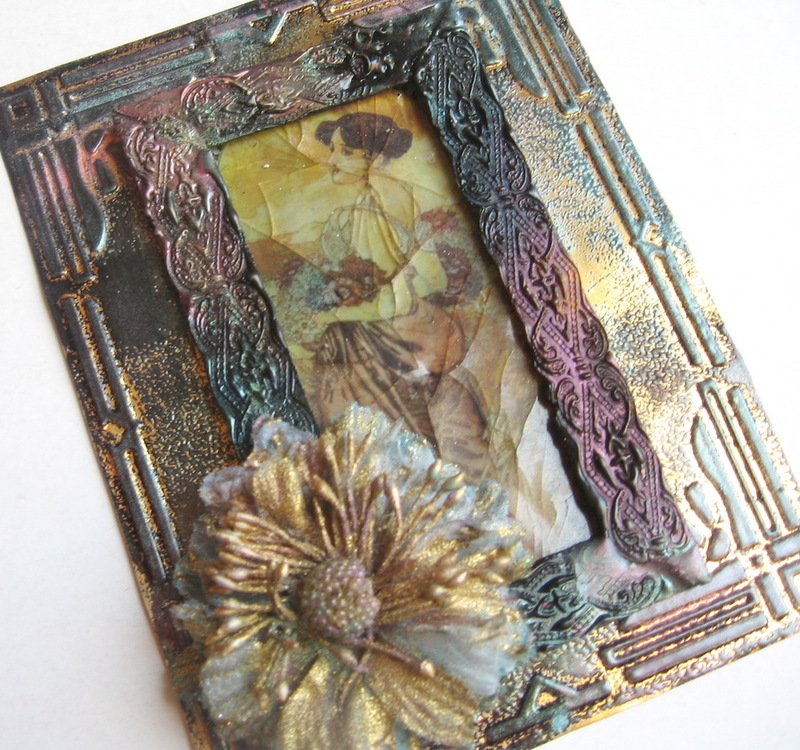 Hand cut a chipboard frame that fits the central image. Cover it with clear embossing ink and Ultra High Ebony Black embossing powder. Make it 3-4 times and please, keep your fingers out of the hot surface! 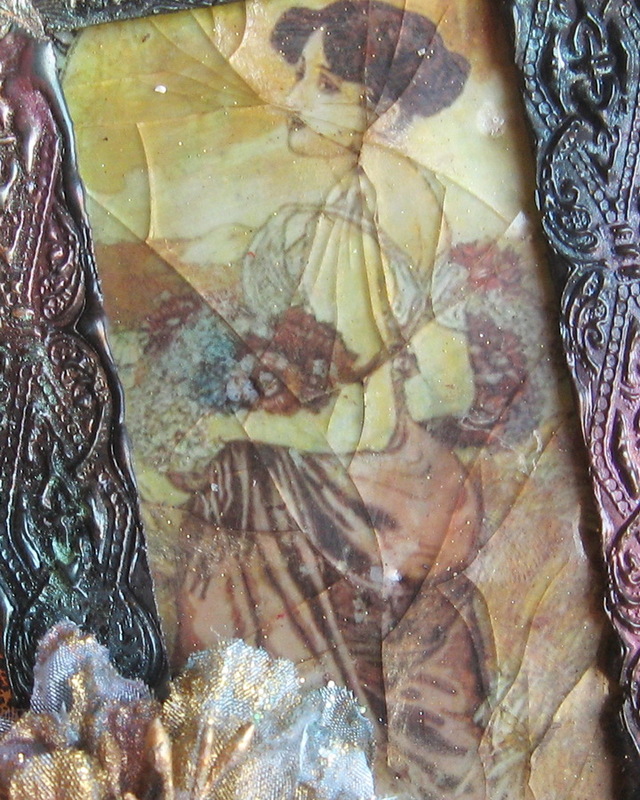 Add a random mix of 2-3 Perfect Pearls over the heat embossed surface and heat it again. Now grab a stamp that we are going to use for this Faux Cloisonne technique: I used a random texture as the size was just perfect for the frame size. Heat each frame part and stamp with your stamp into the hop surface. Let it cool and then make the same procedure with 3 more frame parts. Glue the frame over the image with 3D foam glue. And now for the background frame. Dry emboss the thick gold foil with an embossing folder (I used Cuttelbug Art Deco folder). Cover the embossed parts with a bit of clear embossing ink and this time heat emboss with Fine Ebony black powder. Let it fry and add some Perfect pearls over the frame. Glue the smaller frame over the larger one . Now you can alter a flower. I used Prima fabric flower with some Metallic Gold Rich embossing powder and a bit of the same Perfect pearls and the flower was shrinked by the heat to the right for this project size (was a huge one before heating). 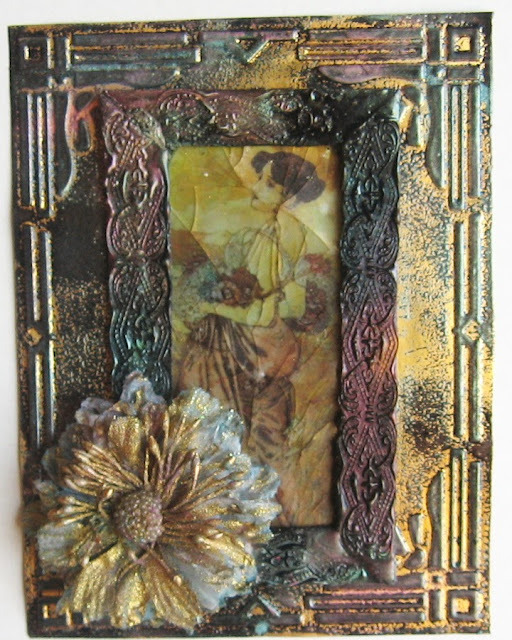 Glue the flower over the frame and your art piece is done. Hope you will enter our monthly Metal challenge and as you know, you need to be in to WIN! The Three Graces- Metallic Art Dolls! Pinterest-Worthy Pins - a Metal Project for WOW! Welcome to the New Design Team Additions!! !